Our Kids Critters 1 Milky Way Soap Mold features four silly animals, including a frog, lion, dog, and fish. This mold is perfect for kids or anyone who loves animals. 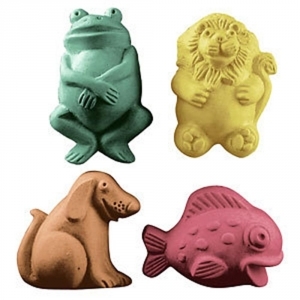 Lion: 3" x 2" x 1.25"
Fish: 3" x 2" x 1.25"
Dog: 2" x 2.5" x 1.25"
Frog: 3" x 1.75" x 1.25"
Notify me when Kid Critters 1 Soap Mold is in stock.